September 28, 2016 – National labor and employment law firm Constangy, Brooks, Smith & Prophete, LLP is pleased to welcome a new of counsel attorney and five associates to its offices in Atlanta, Kansas City, Los Angeles, Macon and Nashville. Renee Turkell Brook has joined the firm’s Los Angeles office as an of counsel attorney. Prior to joining Constangy, Renee was an attorney in the labor and employment practices of O’Melveny & Myers and Seyfarth Shaw. Her clients have come from a broad spectrum of business and industry, including entertainment studios and production companies, hotels, aerospace, manufacturing, and retail. Brook received her J.D. and undergraduate degrees from the University of California – Los Angeles. Garrett Anderson has joined the firm’s Atlanta office as an associate, pending bar admittance. Anderson is a 2016 law graduate of Samford University, and holds an undergraduate degree from the University of Florida. Jarrett Spence has joined the Atlanta office as an associate. He received his J.D. from the University of Memphis and his undergraduate degree from the University of Tennessee – Chattanooga. After completing law school, Spence spent a year as a clerk for Judge Bernice Donald of the United States Court of Appeals for the Sixth Circuit. Nelson Suarez has joined the firm’s Nashville office as an associate, pending bar admittance. Suarez is a 2016 law graduate of Belmont University and received his undergraduate degree from Tennessee Tech University. Spring Taylor has joined the firm’s Kansas City office as an associate. Taylor is a recent graduate of the University of Missouri School of Law, and received her undergraduate degree from the University of Central Florida. She previously spent several years working in-house with a large insurance company as a disability/FMLA claims analyst. Patricia-Anne Upson has joined the firm’s Macon office as an associate, pending bar admittance. Upson is a 2016 law graduate of Mercer University, where she also received her undergraduate degree. These new hires continue a strong period of growth for the firm, which is celebrating its 70th anniversary in 2016. So far in 2016, Constangy has opened offices in Los Angeles and Miami, and has welcomed 26 new attorneys to the firm. Constangy, Brooks, Smith & Prophete, LLP offers a wider lens on workplace law. We have counseled employers exclusively since 1946. 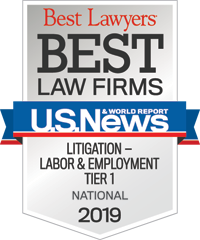 With offices in 15 states, we are one of the largest labor and employment law practices in the U.S. Constangy holds a national Tier 1 ranking from the U.S. News & World Report/Best Lawyers Best Law Firms survey, and has been called a “go to” law firm by Corporate Counsel and Fortune magazine. Many of our more than 175 attorneys have been recognized by leading authorities such as Chambers & Partners, Best Lawyers in America and Martindale Hubbell. Find out more about us online at www.constangy.com or follow us on Twitter @ConstangyLaw.